"BNY Mellon is deeply committed to improving our client experience, resiliency and efficiency through technology. 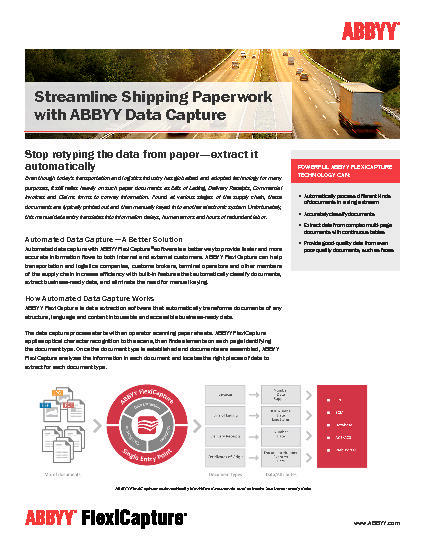 Through outstanding collaboration with ABBYY and MTS, we were able to develop a solution that effectively addresses a long-standing challenge to increase efficiency and accuracy in previously very manual, fax-based process." 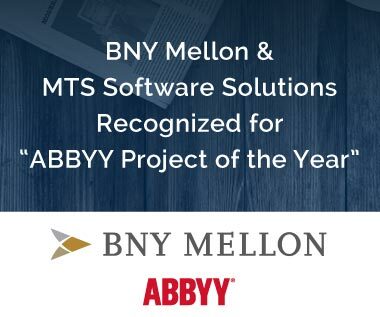 Moorestown, NJ—March 20, 2017—BNY Mellon and MTS Software Solutions (MTS) were awarded the "Project of the Year" award by ABBYY. 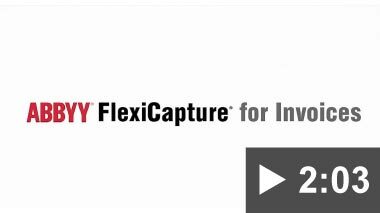 The recognition is a result of their collaboration in implementing ABBYY FlexiCapture to streamline processing of stock trade documents. 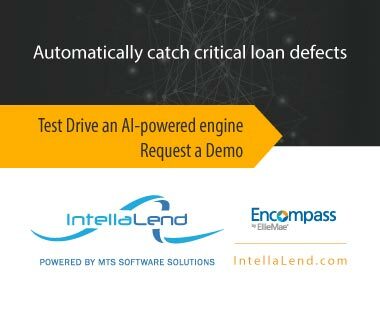 BNY Mellon and MTS have designed and implemented a scalable capture solution that will consistently and increasingly reduce manual intervention and, therefore, reduce costs. The award was recently presented to members of the MTS Software Solutions team at ABBYY's 4th Annual Technology Summit. 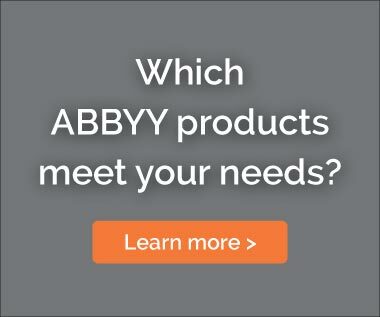 "ABBYY is honored to have a highly-committed partner channel here in North America," said Craig Laue, Sr. Director of Sales & Data Capture Business Unit. "Each year, we recognize a partner's distinctive performance and delivery of our innovative capture and processing technologies. I congratulate the team at MTS Software Solutions as the winners of the 2016 Project of the Year Award, and I look forward to our continued success with BNY Mellon in the future." "BNY Mellon is deeply committed to improving our client experience, resiliency and efficiency through technology," said Joseph Gerbino, Service Owner for NEXEN Content and Document Management. 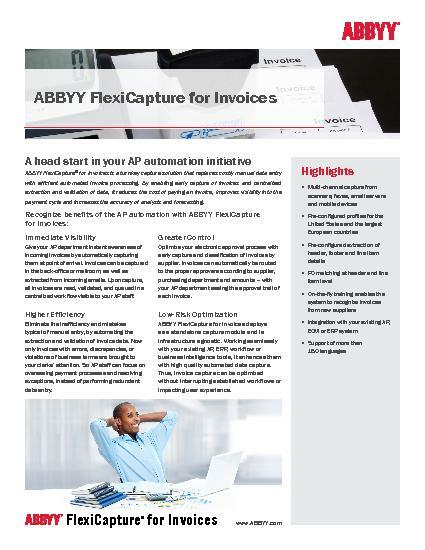 "Through outstanding collaboration with ABBYY and MTS, we were able to develop a solution that effectively addresses a long-standing challenge to increase efficiency and accuracy in previously very manual, fax-based process." "BNY Mellon has clearly demonstrated commitment and leadership in using technology to innovate in the financial services sector," said Vince Hanson, VP of Sales & Marketing at MTS Software Solutions. "We're thrilled to be recognized for our partnership and our work together." ABBYY is a leading provider of technologies and solutions that help businesses to action information. The company sets the standard in content capture and innovative language-based technologies that integrate across the information lifecycle. 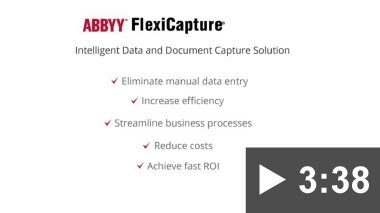 ABBYY FlexiCapture is powerful capture software that works with precision accuracy to convert paper and image documents into business-ready data. 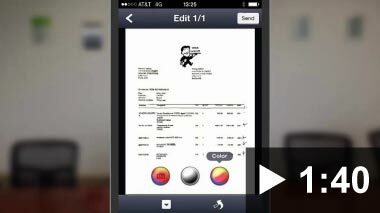 Founded in 1981 and headquartered in Moorestown, NJ, MTS Software Solutions Inc. provides technology and services that simplify, streamline, and accelerate document and data-driven business processes. 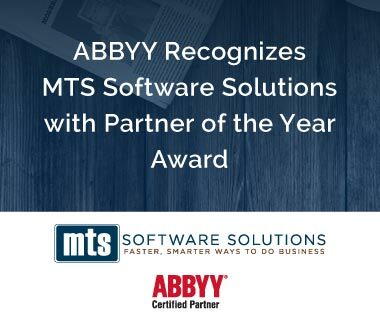 As an ABBYY Certified Solutions Provider, MTS Software Solutions helps organizations elevate profits, performance, and productivity through capture solutions enterprise content management (ECM), business process automation, business process outsourcing, and check/document scanners. For more information, visit our website: www.mtssoftwaresolutions.com. BNY Mellon is a global investments company dedicated to helping its clients manage and service their financial assets throughout the investment lifecycle. Whether providing financial services for institutions, corporations or individual investors, BNY Mellon delivers informed investment management and investment services in 35 countries and more than 100 markets. As of September 30, 2016, BNY Mellon had $30.5 trillion in assets under custody and/or administration, and $1.72 trillion in assets under management. BNY Mellon can act as a single point of contact for clients looking to create, trade, hold, manage, service, distribute or restructure investments. BNY Mellon is the corporate brand of The Bank of New York Mellon Corporation (NYSE: BK). Additional information is available on www.bnymellon.com.